When I’m going to see Alice on the 9th floor, Boris freezes and he doesn’t go up to the door with Henry. I’ve restarted the game and played through it again to see if it was just a minor game glitch, but it’s a reoccurring problem. Ran into an issue with Chapter 3. No matter what I do, when Boris and I get right before Alice Angels door, Boris cannot follow me up to the door because the floor is in the way and he cannot jump. Ive looked at multiple videos of playthrough and no one elses game seems to have the board on the floor blocking the way like mine does. Very frustrating. Literally cannot complete the game. Too many glitches for the price. Started the game and got to Chapter 4 but made the mistake of updating for “Misc bug fixes”. The update caused the game to crash every time I tried to continue my game. Started over and made it to Chap 3 only to find a glitch that everyone seems to be experiencing, and cannot continue forward to meet Alice. This is not money well spent, no matter how good you think the graphics are. Wouldn’t recommend wasting your time with this game until they fix all the glitches. When I first opened up the game, it was horrific and I LOVED THE CRAP OUT OF IT. Anyway, when I played through chapters one through two, no problems.Then I played through chapter three, left it, came back to it, and the door to Alice angels ‘date’ wouldn’t open. So then I had Boris disappear and I had to go to the heavenly toys room to find him. I then continued the chapter normally after hitting the doors with a gent pipe a few times. I completed the chapter without seeing the angel picture supposed to pop up when I chose the angel side in the beginning of the chapter, this made me a bit confused. But when I tried to load chapter four, it would show the preview, then go to black for five seconds, and exit me from the game to my home screen. I went to select chapter and it did the same thing, I have reloaded my phone, done this many times and it infuriates me that I paid 6.99 to not have one of the best chapters of the game work. I went ahead and skipped to chapter five since I have seen the story MANY MANY times before I got the actual game and played it myself. No glitches so far in chapter five. I have heard of a second bendy being an opportunity for Henry to turn this around, and get a different story on the 141th loophole of death he gets caught in and gets supposedly reborn through the ink machine. This is only a theory. But I do believe it will depend whether or not you choose the demon, or the angel side in chapter three. If there is a chapter three in the ‘second’ game. After the recent update Chapter 3 is basically unplayable because of a glitch in Alice’s domain where the gate at the other side of the bridge to enter Alice's domain is stuck on the floor making a little barrier on the floor. Now this wouldn’t be a problem if Boris didn’t have to walk to Alice’s door for it to open and for the chapter to commence but Boris gets stuck on the little bump on the floor. Instead of walking to Alice’s door and it opening Boris gets stuck and you cannot play the chapter at all. This is upsetting because chapter 3 is my favorite chapter. Now this may just be a problem with my game but still PLEASE FIX THIS GAME. This is still a good game though please like if you are having the same problem. Quite the suspenseful puzzle-themed adventure! Ok so me and my friends love this game but there is a glitch in chapter 3 when we have to go meet Alice Angel where Boris has to walk up the stairs but something is blocking him. The entrance has something poking out that prevents him from walking. I am playing on IPhone 7 and i finished chapter three but it won’t let me continue to chapter 4. Otherwise the game is a great experience. I like the different characters in the recordings. 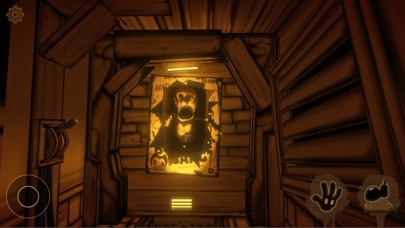 So, I was playing chapter 3 and as I went to Alice in her base, Boris got stuck on the stupid door thing, and even when I quit and came back, he didn’t move AT ALL! Please fix. I honestly really like this game so far, but I’ve noticed something that’s only happening to my device. In chapter 3, on “a date with angel” I can’t finish it because the character Boris can’t jump over this pipe so I can’t finish chapter 3. I’ve played chapter 3 five times so far and I still can’t figure out how I can fix that. Since I couldn’t finish chapter 3, I tried to skip it and go to chapter 4 but whenever I try I’m kicked out of the game. Any ideas??? Other than that the game is amazing and I’m super excited for Bendy and the Dark Revival! It was running fine until getting near the end of chapter 3 and it kept crashing when I died.. so I said no deal I just won’t die no more.. but now I completed chapter 3 and it won’t let me continue the game anymore to load chapter 4.. it’s a great game with a creepy feeling. I hope you guys fix this so I can complete the game. 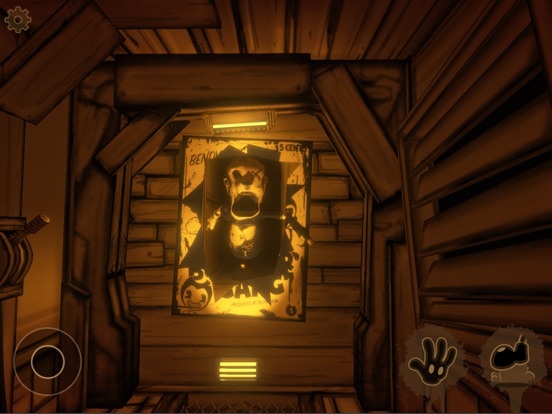 Bendy is a great character design and I can’t wait for bendy two to come out on mobile as well.I wanted to let you know that there is a glitch in chapter 3 at level nine. At the gate there is sometimes a bar and Boris can’t get past it. But it’s the best video game I’ve ever played. First off, this game is amazing. The graphics are great, the voice acting was superb, and even the movements are smooth and fluid. The only problem I find with the game is Chapter 3 and 4, and now 5, crash every time I open it up. I’m not sure if that’s my phone, or the game itself. Other than that, I have no complaints about this game. I strongly advise horror game fans to play this, and weak willed people to steer clear. This game is not for the faint of heart. In other words, this is the greatest horror game I’ve ever come across. When you get to chapter three when you go to level nine when you get to the entrance it’s halfway opened! Boris can’t even get over there but you can! You can jump! When I was normally playing chapter 3 I found the thing that Alice puts down when she tells me what to do next, the thing was on the GROUND! I was able to jump over it but Boris had a problem getting over it! He couldn’t even get over it! So I couldn’t get to trigger the next part because of that! If the creators are seeing this, please fix this bug. Thanks. First let me say, I love this game. Thank you Meatly and Mike Mood for creating the game. I’ve noticed lately there is a glitch in chapter 3 where near where elevator when we walk across to go see Alice, Boris is not able to cross. Is there anyway this can be fixed? Thanks all! Looking forward to Bendy and the Dark Revival!! While it is the BEST horror game ever, on mobile when you need to collect 5ink hearts it will cut you out of the game and you can’t finish chapter 3 cause of that. Ok. I just updated the game to the latest version, which took FOREVER to update, and I clicked “select chapter” and clicked chapter 4. It showed the loading screen but then the game crashed, so I tried it again. Same thing. This went on for 25 min trying to fix it, but I couldn’t get it to start. Pls fix this. This is a great game, but while putting the items on the pedestals I randomly fell out of the map. Help. I can’t even load chapter 4 without it crashing. ALRIGHT, so I’ve beaten this game a bunch, but On my phone, Ch.4 seems to crash continuously upon selection. I just figured I’d let you know, thank you! I love it but what’s this? I love this game soo much and play it a lot, but in chapter 3 when you go to floor 9 for date with an Angel, isn’t Boris supposed to go up to the door with you? Mine is getting stuck on a gate and I just stand at the door with nothing happening. It’s a great game.Fun and thrilling but when I play chapter 3 Boris is just to LAZY to get over one plank to where we need to be.I tried again and again and redownloading the app. This is the only device I can see full screen and details. A few glitches but good! There is this glitch that in chapter 3 when you go to Alice angels place Boris won’t go past the thing can you fix it thank you! For I have been a fan of bendy since chapter 2 was released, but I couldn’t play the game because my computer had a virus. So I watched gameplay and studied the game and then I was a fan. It was until it came out on mobile when I truly experienced the thrill. Now I played it on pc for the halloween crossover and it was great but it was not the same though. The graphics are not the same. I do also own the game on ps4 and it is better but still it’s ok. That doesn’t change my opinion on the game. I rate the king of horror games!!! Why can’t Boris go through!? One of the best games out there! I was really surprised that the game came out on mobile, and even the graphics were good! There are a few minor bugs like in chapter 5 for example, when you fight Sammy, you can get pushed out of the map. And at the end, the graphics went down a LOT when you talk to Joey. But all in all, the story is hard, but not too hard. The whole story line is amazing! I’ve must’ve beaten this game 4 times now in about two weeks! This game is probably the best game on mobile! The price is reasonable, the game is so incredibly addicting! My favorite chapter is probably chapter 4 because of all you have to do. It’s kind of short but not too short. I especially love the turn on Boris when he becomes the “Frankenstein” Boris or more commonly known as Brute Boris. This is the game I will come home to and play and try to get everything done and see everything I missed! I love this game so much and I recommend all you other people so buy this game so you can play until your hearts’ content! I love this game it’s such a interesting store line and also I can’t wait for Bendy and the Dark Revival to come! I have to say this game is wonderful everything that pc game has is in this. I do have a problem with chapter 3 I get past the toy factory to fix the machine it crashes it also crash in the toy factory main part. This game was THE BEST! Because all the small details and stuff, I completed chapters 1-5! I loved it! Lag isn’t a problem for me because I don’t I actually care about lag, I just wanna play the game! This game gave me the chills. It is really good 5 stars recommendation. This game is on point! THIS IS THE BEST GAME EVER!! SPOOPY CARTOONS!!!! CANT WAIT FOR THE NEXT GAME!!! Really dude we cannot play anymore! Is it just me or is this games crashing so much? I’ve been noticing that chapter 3 hasn’t been working for iPhone 6’s. I have the same issue and it hasn’t been resolved for about 3 months, and the last update was 2 MONTHS AGO. Cmon! The game needs to be updated, I’ve been checking it everyday and I have been so anxious to play it again. I believe it’s not just the iPhone 6 either. Anybody with an iPod had this problem also? -The not so anonymous consumer because I’m pretty sure my name’s on this. 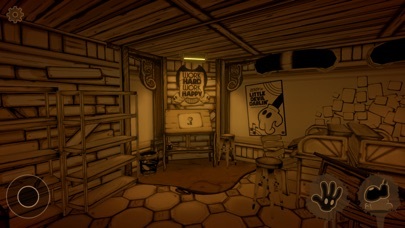 You guys are a amazing I hope you make another bendy and the ink machine I got scared this game has everything you can possibly want bendy freaks me out and btw if you are reading this I now how to get the tommy gun in chapter 3 steps: morph the ink that in toy machine where the tape is and take the devil path if you go to were the perfectionist is with the tommy gun and shot him then you can get the hearts no sweat 😎😎😎 and also please fix this the lag. I have almost passed level 3 3 times already! It keeps kicking me out and I have to start over! And on top of that I keep getting stuck in the elevator on level K!!!! Impossible aiming controls at certain points due to sepia color scheme. Idiotic unclear puzzles when dealing with AI mobs. Typical of ported games. Total trash, wasted my money. Lesson learned, never again will I give money to a lazy PC dev doing a crap port of their game to mobile for easy cash. I’m buying mobile native only from now on. Shame on the devs. Half arsed bio shock ripoff in cartoon form. Trash. Don’t buy. I was playing and when I got to the part when you fight Sammy he glitched me to the other side of the fence thing and now I can’t fight Sammy I can fight him from the other side but when he says “Don’t look at me!” And runs away I cannot reach him. 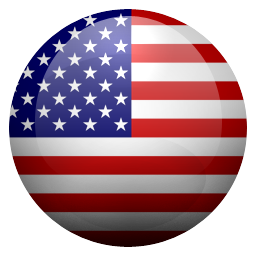 Hey this game is truest awesome! So many people worked so hard and that’s what matters so keep it up! I love the archives and like to see the backstory of some of the characters and development but there’s one thing I want to request if you see this. The projectionist is by far my favorite character and I don’t know why. I know he didn’t play a very big role or anything but I would love to see him in the archives. I know it would be a bit of a pain to do but hey it’s up to you. It’s ok if not I really don’t mind but it would be awesome. Anyways great game and good job! So, I like this game, I really do. When I saw this game on iPad, I knew I needed it. But the problem is, I’M STUCK. On one of the levels (3 or 4), I got stuck. I WAS collecting ink hearts for Alice Angle, but then my iPad ran out of battery, and it shut down. When I got it back up and opened the game, THE INK HEARTS HAD DISAPPEARED. I don’t want to have to reset the level, it took me so long to get to the ink hearts part. Please, I need somebody to help me... I don’t know what to do! I’ve restarted my device, it didn’t help. I’ve quit the game and went back to it. I’VE WENT TO EVERY SINGLE LEVEL THEN BACK. I’ve found Ink Bendy, I’ve found the Projectionist, nothing’s helped. I know you guys get a lot of issues, and reviews. But I’m stuck. Nothing I try is working. And I really don’t want to have to redo EVERYTHING. I need some advice on what to do. Thanks for readings this long complaints though! At first it seems perfectly fine! That’s until you reach to Chapter 3. You cannot finish the chapter because when you’re at the final stage, it crashes! It crashes multiple times in the chapter and you always have to keep rebooting the app. But no matter how many times you go back into the app, it always crashes! It’s impossible! You cannot beat Chapter 3 because of that. Because you can’t beat Chapter 3, you can’t continue in the game and reach the end and open the archives. It’s a total mess! Either you fix that or I demand a refund! Its like half your game wasted! To go to the next chapter you got to select it! But that doesn’t save and you won’t open the archives! Great game but shouldn’t be on mobile if it’s like this. Hopefully the developers fix this in the future or lower the price for the app because I didn’t pay $6.99 for it to keep crashing. Would’ve been a five star if it wasn’t because of that. I’m strait up obsessed with this game, but I can’t continue to chapter 3. It kicks me off whenever it’s done loading. Please fix this glitch. But other than that THIS IS THE BEST GAME EVER!!!! Just the way the little devil likes it. I *was* enjoying this game. I thought it was wonderful, and I was playing this version while desperately waiting to get my own physical copy at GameStop. Then I played chapter 5. Chapter 5 COMPLETELY DESTROYS THE WHOLE GAME. BIG TIME. After everything this game had going for it, along comes chapter 5 to completely ruin everything beyond repair. I mean, we are talking a “Matrix Revolutions” level disaster here, folks. I’m warning you right now - whatever idea you had in your head regarding how this thing might end, no matter how lame or embarrassing it might seem to you personally, I STRONGLY encourage you to hang on to it tightly and treasure it dear, because whatever it is you personally dreamed up has GOT to be better than this. I’m not going to give away any spoilers regarding what happens in Chapter 5. Suffice it to say that during that chapter the game is not content with shooting itself in the foot only once. Everyone is anxious to learn about the mysteries behind everything going on in this game and the big reveal in the climax. But I’m telling you right now that if you knew what they were, you wouldn’t want to plunk down your hard earned cash and buy this con job. Chapter 5 reveals the whole game to be nothing more than the shaggiest of big shaggy dog stories right from the get-go, and in a way it is ALL mysteries. As for that much-ballyhooed “big reveal” in the climax that explains what is going on once and for all, I’m just going to say this: it is so trite, so typically Hollywood-esque in its “cop out!” predictability, and so flat out-and-out completely insulting to one’s most basic form of intelligence that it is only a mere one step above “it was only a dream”. It’s the crummiest ending they could have picked, and it seriously gets one to thinking that the creators were making everything up as they went along. What an absolute scam. I was so shocked and angry about it that I cancelled my GameStop preorder and want nothing more to do with the game, and I wish I was never duped into buying this thing. >:-( AVOID BUYING THIS BEFORE IT’S TOO LATE! This game is my favorite!I play it for hours over and over again,it never gets old! I love the game but there is a HUGE problem with chapter 3!When I go to level 14 to get the hearts and five seconds later, it stops, the screen turns black, the game turns off and I have to go back into the game, and I have to go all the way back to level 14 and I have done that like 13 times! So far in chapter 1 and 2, the gameplay was amazing! But, when the game progressed to chapter three, it crashed as wouldn’t let me play chapter three. This has happens twice with new games, and another time when I tried to select chapter three from the select chapter menu. If I die during the haunted house boss fight in chapter 4, the game crashes, causing me to lose all my progress and repeat a minutes-long cutscene. This is unacceptable. I am unable to finish. It’s a shame, because I was enjoying the game until this point. Listen this is my favorite game but it has a bug in chapter four that my iPad glitches when ever I try to grab the bubble thing from the searcher in the pipe thing so I hope you fix it. No, I’m not mad, I’m just annoyed about it. That’s all. But still, love the game thank you themeatly for creating this game. That’s the only glitch in ch. 4. Nice but could you add these? Ok I gave this game 4 stars because I honestly LOVE ❤️ the game it’s my favorite but the thing is that I play on my IPod and I didn’t play it for like half a month because it keeps glitching. 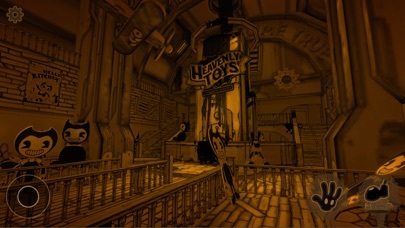 I have been playing the game for about 3 months and I am only at the part we’re u have to do orders for Alice angel. When it glitches it sends me back to my home screen and I even tried lowering my quality to low and it STILL DOES ITTT. Plez Plez PLEZ Fox this it’s my FAV game and right now it’s ruined. Thank u for taking the time to read this long message and I hope u fix this and hope u have a great day. It’s good to have a game like Bendy on the go but the problem is that when I take the stairs at level 14 of chapter 3 my game crashes so can you pls fix this pls? Bendy and the Ink Machine isn’t at all a bad game, it has its faults with it’s story line here and there, but then again all games do. The touch controls, in my experience, are great. They’re very fluent and easy to use, however if you’re someone like me who uses a controller, you’ll be happy to know this game supports Bluetooth controllers! There’s a catch however, the game (as of writing this review), only has partial controller support. I use a Steelseries Nimbus controller, on this controller there’s a button for the Menu or to Pause the game. When clicked this button does nothing, the button isn’t broken, it’s just not being used. To pause the game you have to move your hand to the top left corner of the screen. 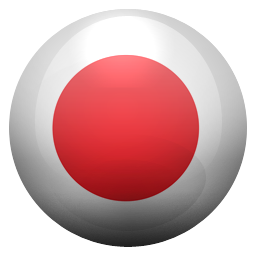 The same goes for when an objective comes up, there’s no button to view the objective, so you have to touch it to open it. Other than those things I really have no complaints about the game, if you don’t mind the partial controller support, I’d recommend picking this one up. Because of these issues, I give the game 4 stars. If this issue happens to be fixed, I would give it 5 stars. I know this is my third time editing this review but now that I have finally finished the full game, I can make a review on everything that I think needs to be fixed. So general gameplay and story is amazing! I really recommend to people who love survival/horror and I can’t wait for the sequel if there is one. There is just a few bugs that are really game breaking, or make it hard to beat in general. So first, the frame drops. They are really annoying, and happen mostly in chapter 4. Something that really needs to be fixed is Bertrum. His fight makes the frame rate drop dramatically and it makes it almost impossible to beat. It took me 10 minutes to beat him because I had like 5 FPS even at low quality. They really need to do something with it or maybe even remove it because I can’t even aim at the circle things that keep it together. So basically, I really only want them to do something with the quality so that in places where the frame rate usually drops, it’s not that bad. Thanks! I do wish I could give this game 5 stars, as the graphics are great as well as sound and visuals. The only problem I have is at Chapter 2 where you open Sammy’s sanctuary. I found Wally’s keys and opened the closet and listened to the audio log. The pattern was Piano, Banjo, Drum, Piano at my first time playing. So I went into the recording room and proceeded to make the same order, but nothing happened. So I logged off for about 3 hours. I got back on, selected continue and I ended up right by the audio log. So I listened to it again, and it was Piano, Bass, Piano, Banjo. So, I again went to the recording room, and made the same song Sammy was talking about. But again nothing happened! I even looked up what the instruments looked like to be completely sure, and went to the closet to listen to the audio log repeatedly. But every time I went back and did everything correctly, nothing happened. Any way I can fix this? I love the PC version but was disappointed by the Console version, so I was worried sick coming in to this version. But what I got was a really good port that was a hair away from being just as good as the PC version leaving the Console version in the dirt. I will say I was playing on the lowest quality setting and it was lagging a lot at some parts but I’m playing on an iPad from 5 years ago so it’s not there fault and It didn’t stop me from enjoying the game. Not to mention they added something to chapter 5 that is exclusive to this version that makes me wish they would add it to the PC version, and that is the option to skip the 5 minute opening cutscene. And they also changed some stuff to make it work with the controls. I would definitely recommend this and if you have a newer device you’ll get a better experience. Amazing but buggy even after update. No change! January 2017: A few crashes but the biggest glitch was near the end of ch 5 and I quit for an hour. When I returned, I was no longer in the machine where I had been, but was in the hallway after leaving Tom and Alice on the bank. Problem is that the door is closed and the lever down so there is no way back inside. I cannot complete the game without starting the entire chapter over again. I started over, lost all progress, and the same thing happened. So, do not stop after starting ch 5 or you’ll have to start from the beginning. I started over AGAIN and this time got to the machine but after knocking out two ink columns, I died but when I was revived,I was still in the room but the ink monster was stuck running in a corner. Nothing could coax it out so it is another glitch. Geez. Please offer more chapters!! First, fix the bugs!! February 2019: The door was suddenly open so I broke two ink spouts, but two were left and it allowed me to exit the room and end the game. Huh? Glad I could finish somehow but wasn’t worth the frustration with bugs. That said, I do hope the devs offer more chapters (minus the glitches). I have this game on PC, but the mobile game is alright. I'm not much of a fan of mobile games, but now that Bendy’s on here, I'm going to be playing on my iPad a bit more than I used too. CONTROLS The controls are pretty normal for a mobile game, you got the pad to move your character, a jump and interact button, and they all feel very comfortable. However, there is one tiny flaw that, at least for me, stands out the most, and the buttons are too big. I can handle the size of the buttons, but I had some trouble with controlling the game. GAMEPLAY I'm surprised that my iPad can even run this game, but the gameplay (and graphics) are amazing, well, for a mobile game. There’s not much to say about gameplay (and graphics), so I’ll just end it here. 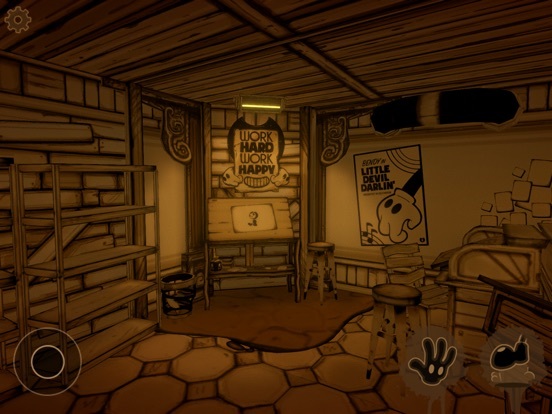 CONCLUSION Well, if you never got around to playing Bendy because you didn’t have a PC or Console, consider this: download the game on your mobile device, and you’ll be happy with what you got. T H E N D Thanks for reading! So glad it’s in mobile now! This is a game that I have always wished it was available on iOS ever since it blew up on the internet and I watched gameplay videos on it. I was really happy to see you guys porting the game to iOS and I must say, it’s amazing on iPad! However, it’s a bit laggy especially when fighting monsters and not smooth, and this is coming from someone who is playing on an iPad Pro 10.5. I think you should fix it and optimize it, as it would make it an even better experience. Other than that it’s fantastic game and I’m sad it’s over. The art style is incredibly unique and gorgeous and I am amazed by all the little details the game provided! I love this game and have loved playing it but it crashes regularly. First it would crash every time I tried to play it and just at random points. I got around this by playing using the chapter select feature until I got to the end of chapter 3. All was going well until Alice had me go down until level 14. Every time I get to the point where Alice is about to speak about the Projectionist it freezes and kicks me out. I’ve tried using the select chapter feature but the chapter is just to long to get to the same point without crashing and I’ve started a new game twice but nothing changes. Is anyone else having this problem? Does anyone have any tips that might help? Could we get a patch or something? Please and thank you. First off, this is an amazing game, I love it so much that I would give it 5 stars! The fact that when you buy the game, you don’t have to buy the rest of the chapters-they’re already unlocked- is great! And it’s only about 7 bucks. Wow. Now, adding on to what I said earlier, I said I WOULD give it 5 stars. The reason I gave your game 4 is because of the ridiculous save system. You’re probably wondering what I’m talking about, because there isn’t a save system, and that’s the point that I’m trying to make. Can you make it save once you leave? Because of this, I couldn’t play the archives, the ? chapter, once I’ve killed Bendy. Please fix this for me. I love this game so much. I have it of course on my phone and on my Nintendo Switch. 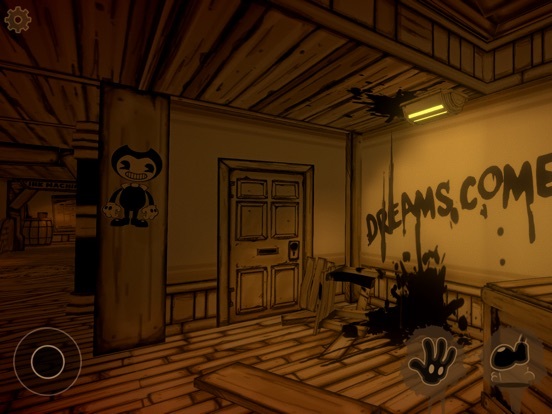 One thing I was kinda disappointed about is that when Bendy appears, there is no Ink veins or anything that covers the walls or anything. I know it covers the screen now but when I try to escape Bendy I sometimes can’t see where I’m going. 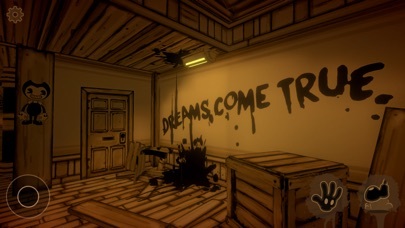 Is there any way you guys can add a feature to where you can choose if you want Ink veins or cover your screen when Bendy is close. If this isn’t possible just change it to where you can turn off the inky screen. Thank you. Ok, I totally recommend this game if you like horror games and jump scares. I’m not a big fan of those, but chapter one Bendy made me scream 😂 Right now I’m on Chapter 4; I did watch a full gameplay but I wanted to check it out for myself. 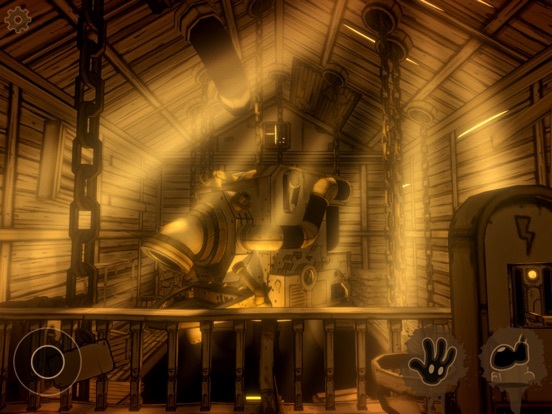 I don’t really get what the mean in Bendy ‘Land’ when the mission is to ‘Power the Haunted House’ Tip: Search the Warehouse. I’ve searched the whole warehouse. Poor Henry..😂 this game is totally everything. What’s weird is someone asked me if this was GRANNY! I’m like, “ Does this look like GRANNY to you?” I didn’t say that but I was confused 😂 this game is really fun, and I really recommend it! Finally its out yes! Creators I found some bugs in chapters 3 4 5 in 3 the textures it’s crashing in my iPod touch and the graphics I put low or medium but the game its crashed in the part of the butchergang and pow the game its close now in the 4 in the part of the recolect and craft for the elevator it’s crashed too and the part I found workes the its close too now in the 5 welp.... textures crashes and bugs oh fixed the controls please fix this cool game creator. Oh I forgive i have the game in IPod Touch so fix please and thank you 😊. So I started playing chapter 1 and chapter 2 and boy am I astonished at how this beautiful pc game, somehow became a mobile game, and it still looks wonderful! I do have one flaw though, when I run the game on my iPad (which I use most of the time to play games on because of big boi screen), the move, jump, attack, and interact button are really small and really hard to control on a big screen, but other than that, I love this! Thank you for the early Christmas Present, Meatly, Mike, and everyone else who helped work on this game! This game is AMAZING in almost every way! I’ve watched DanTDM play this game before I did and I am proud to say that I wasn’t disappointed. The only thing that I have trouble with is there is a glitch in the game that won’t let me play the third chapter at all. When I try to load the chapter, it crashes and I have to get back in the game and try again. I have tried four times already and it won’t let me play it yet, but I am still trying! 😊 Amazing graphics and game mechanics! Will not disappoint! The game is great! I really enjoy everything about it and then BAM chapter 3 won’t load for me. I thought it was my iPad but then I looked here and saw that chapter 3 didn’t work for some people. 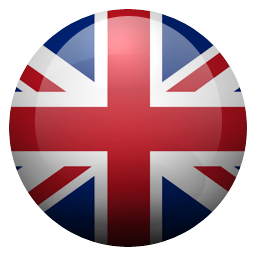 I understand the game has only been out for a short time in the App Store so I get there will be some bugs. I just really want to continue my adventure into this game as soon as possible. If nobody reads this I at least hope someone will read another review saying chapter 3 doesn’t work at the moment. Ok so I know every game is gonna have a big here and there but I feel like this just wasn’t finished, a sloppy attempt to convert from pc to mobile it seems. I really loved the first 2 chapters but nothing after that worked. And the punch in boxes don’t seem to actually save your progress, they just put you where you should already be given that you made it to the room. I’ve lost progress because of it. Maybe I’m wrong and those boxes aren’t actually for saving progress. But my main issue is not being able to play the whole game, that I paid for. A little bit of humor as, while doing Alice’s errands, I can’t seem to call the elevator. In this very same chapter, Thomas Connor mentions that sometimes the elevators just don’t work; though this does cause some concern. I don’t know if this is a bug or, if it is, will I even be able to complete the game, since I need the elevator to get to level 14 with The Projectionist. Otherwise, the game runs almost perfectly, even on my old iPhone 6; minor lag issues as the phone starts to get warm. This is just wow... the visuals are so good especially on chapter 4! It’s just such an Amazing and marvelous game and I did not expect it to come out. Well done devs and people. I literally screamed when I saw this come out and I immediately downloaded it. I also like how you do not have to pay for the chapters. Who knew such an a cool game from the pc could come so well done on iOS? Thank you so much this is the best day ever and this is definitely worth the money! The game is great and all! Except I have encountered two glitches. One where if I press the button which is supposed to bring the elevator up so it can take me to the basement where the Projectionist it doesn’t work. Then recently I have been unable to progress in Chapter 5 because after the pasty where you have to avoid Benny’s dashes I quit assuming the game would save. Instead I respawned outside the door with the lever near the ink banks. Except the lever is already pulled down but the door is still closed thus impeding progress. This is probably my favorite game I have ever played. The graphics and gameplay are amazing, the voice acting is on point, and the story is intriguing and creepy. My one complaint is that I wish it had been a little scarier. But other than that, it’s basically perfect. It’s also very replayable, I’ve been through it several times now and it’s still entertaining. Such a great game. When I first got the game, it was difficult to figure out. But, after a few attempts, I got through all 5 chapters, hoping to get the Archives Chapter, but it seems to not work for mobile. Apparently, from what I’ve read, you have to beat Chapter 5 in order to unlock the Archives level, and I did so, but it was still locked, and I didn’t get to use the Seeing Tool in the other four chapters as well. Please help! So I was playing chapter 5 today and when I was done fighting the searchers and the lost ones, I came across this bug where Allison didn’t break the keychains. Then I played again and when she did break the keychains, I would’ve feel but I didn’t. Please Please Please Fox This Issue. Edit: ok now I’m on chapter 3 and I’m on one of Alice’s Tasks and I Had A Saved File, and when I Loaded in, the Buttons on the elevator weren’t working so I was trapped. This is an actual issue. I saw a YouTuber play this game and I Thought it would never be on IOS but it is so then I bought it and I thought it wouldn’t be so good because it was on mobile but terns out it was very good I just think for seven dollars it is a little to much money I think it should be five dollars any ways I still think it is a good game so I would recommend buying it peacccccceeee! 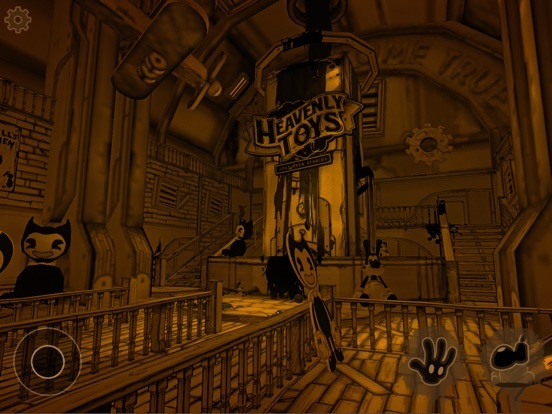 I love BATIM and everything associated with it (aside from inappropriate fan art), but as of me writing this the app needs major fixes. Besides the lagging (which is constant) level three won’t even let me play, I just go up the the door where Alice is supposed to give me instructions and nothing happens. I would recommend waiting to buy this until there is a patch, and sadly if that doesn’t come in the next few months I will have to ask for my money back. 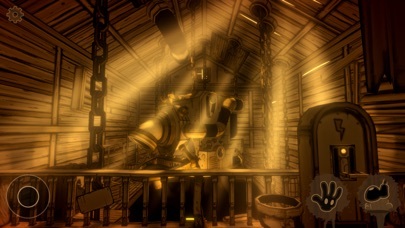 This game is amazing and there is nothing bad about it but the main reason I’m making this review is so that Joey drew studios could fix the the glitch in chapter 4 where Henry goes through this door and there’s a big sign that says heaven toys and then Henry says I don’t remember this. Because right at that moment it kicks you out of the game so please fix it thanks!! !